- Pour Maple Syup into pot. - Heat without stirring, to soft-ball stage. - Remove from heat and let syrup sit until you can touch the bottom of the pot comfortably. Add one teaspoon vanilla (we didn't have any. I omitted the vanilla). - Stir the mixture vigorously. It doesn't seem like it should work. In fact, nobody in the household believed that it would. When the syrup cooled, it was very sticky and difficult to stir. It looked nothing like maple candy. But I worked hard and kept stirring and something magical happened--the gooey mixture changed from seeming like a failed ice cream topping to professional tasting maple candy. It happened instantaneously. I was hooked. 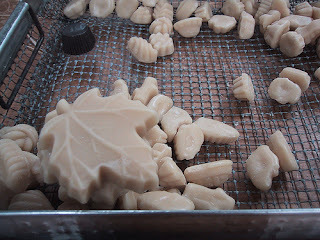 We didn't have the beautiful molds used for the maple candy pictured so we rolled the candy by hand into balls an pressed them into a lined mini-cupcake pan. They ended up being about the size and shape of small Peppermint Patties. And they were delicious. That was my first foray into candy making since childhood. Heating the sugar took a long time, and I didn't have a candy thermometer. But the transformation of texture was amazing, and it's something I hope to chronicle here, with photographs and instructions. Making candy is difficult and there's not much help on line: just Google some candy making terms and you'll find that most existing websites haven't been updated since 1995. Here you'll find cookbook reviews, recipes, tips, along with chronicles of my successes and failures. Feel free to advise me along the way!